Do you have stuff we can use or sell? Examples: a Go-Pro Cam, a Yacht (why not? ), securities, Mac toys etc. Contact us to make a tax-exempt stock donation. 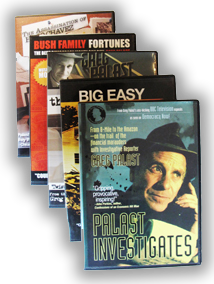 We can send a notice to the recipient of your choice to let them know that you have sent them a gift in the form of a donation to The Palast Investigative Fund, send us an email to let us know who you would like to donate in honor of. You might consider leaving assets to The Palast Investigative Fund in your will. If so, let us know.